Our way with words can’t be compared with the likes of Shakespeare, but it can deliver qualified sales and marketing leads that bring greater revenue to your business. Ah, writing. Our language given shape, the art form of some the world’s greatest geniuses. The lush verdancy of William Faulkner; the taut machismo of Ernest Hemingway; the visceral poetry of Cormac McCarthy. Except you won’t find any lush verdancy or visceral poetry at Tomorrow People. (Although you might find an echo of Hemingway. The King of the short sentence has lessons for any marketing writer.) Because the first thing to understand about our editorial copy is that it’s a business process. The business of generating qualified sales leads for our clients — not making anyone coo at our wordsmithing skills, however deep such skills may go. What is content? Fuel for your content marketing campaigns. Narratives to strike up awareness, interest, desire and action among a specific group of people. What content is not: the latest Forbes cover feature with Mark Zuckerberg that’ll change the world. You want strong thought leadership? Have something different to say (we’ll help you find it), but know what that is and be brave enough to disrupt. Thought leadership can’t be half-arsed. Who writes the content? It’s a mix. Some copy is written by our in-house editors, some is given to our specialist editors. We handpick the editors we work with based on their expertise in any given vertical. If you’re healthcare, you’ll get a healthcare expert. If you’re manufacturing, you’ll get a manufacturing expert. See where this is going? 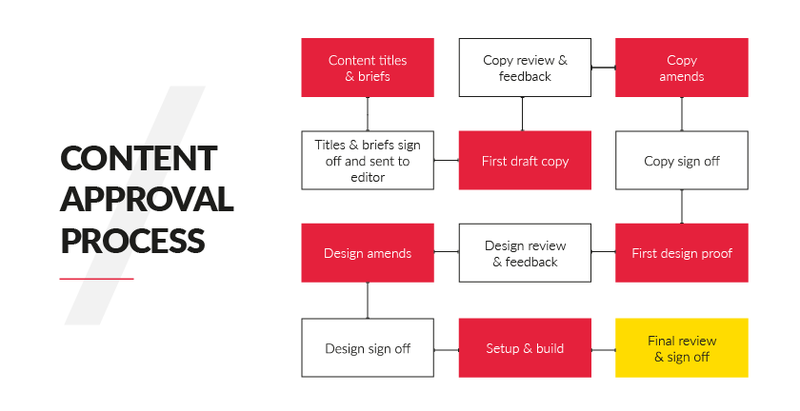 Content production is a process, with an orderly progression from A to Z. The way to get great work from your agency? Contribute to that process. If you can sum up your product benefit in a single sentence, let them know. If you know anecdotal stories about how customers used it, tell the tale. Anything that touches on the human part of what you do can inspire your editorial team to greater heights. 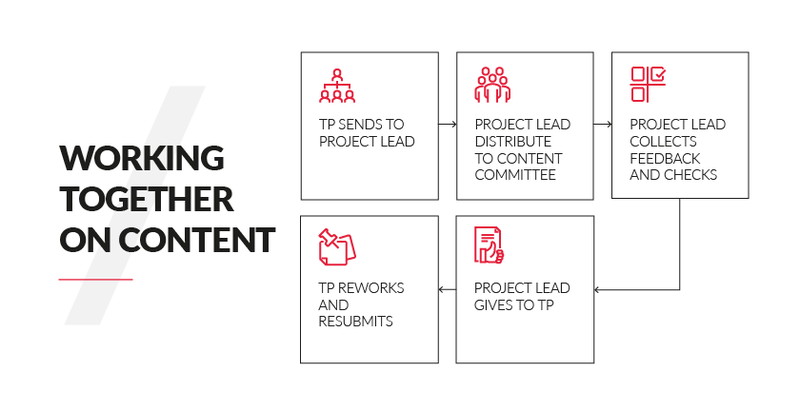 Collaborate with your content team in the same way you would your account management team. As our last secret revealed, you need to deliver your input and feedback into the mix. So share! Your content will be richer for it. Now, the corollary. While writers will love your insights, they’ll be less keen on you writing or rewriting vast chunks of copy yourself. The whole point of using an agency is that it allows for objectivity — which will help your content marketing reach a broader audience. So once you’re confident your agency understands the brief, let them take your content where it needs to go — with a critical eye of how it compares to your competitors. That objectivity is what you’re paying for. When you see the first draft of content for your marketing strategy, whatever you do, don’t immediately start to edit. Because you’ll edit based on your extreme closeness to your product or service — and we won’t get audiences into the funnel that way. It’s surprising how much so-called “content marketing” across the web sounds like it’s taken from a product sheet. Instead, put yourself in the position of a prospect. Did a paragraph say something you didn’t understand? Did a sentence not ring true? Did a word not make sense? This is how a cold reading adds value. But if you’re changing it to “how I’d have said it”, you’re losing the value your agency provides. Review, don’t edit. “I don’t like it” is the worst feedback any writer can hear — it’s imprecise. Make sure your feedback is evidence-based. If it’s a five-point articles at the bottom of the funnel and you feel the points are in the wrong order, suggest a switcharound. If it gives too much emphasis to a target market you’re not approaching, suggest reducing word count there by a third. The more concrete you can be, the faster we’ll reach final copy. Second, always feed back a consolidated whole. If there are six people on your content committee, they’ll have six different views, and some of them will conflict. The project lead should always gather them together to give a single list back to your agency. Remember, you’ve all got the same goal: generate leads (again, not the cover article with Mr Musk or Zuckerberg). 5. Edit your content committee! Speaking of the content committee: you’ll probably find after a month or two that some members belong there and others don’t. So feel free to mix things up a bit. If the Head of Engineering is rewriting thousands of words a month, it’s worth a reminder that his role is to check for technical accuracies, not be the next J. K. Rowling. If your CPO and CMO are arguing endlessly over every draft, decide whose views better represent your offer and communicate your final word to them. Hone your content marketing committee until it’s doing what it should: adding value to the editorial process. If all it’s adding is time and frustration, prune it. That said, it’s often people in your company who bring your offerings to life for our writers. Their deep knowledge of your products and market — where you’re strong and weak, those anecdotes about customers — all add colour and detail to the work that emerges. So always be open when your agency asks to interview your key stakeholders. Many times they’ll be named as authors of the piece; so their real-world expertise needs to shine through. It often doesn’t take much time — maybe an hour per interview. But the effect it has on your content is golden. Ideally, approval happens on a set date. Once approved, let your agency run with it. Don’t allow further changes; any people invited to comment who haven’t responded have missed their chance. Well, once a piece of content gets approved, it goes through further processes before appearing across the web. A designer will be laying it out either as a guide or a series of web pages; a coder may be annotating the pages with search tags; even the writer may be re-paragraphing and copy-fitting to make it look better across different devices. Any changes you make at those stages take ten times as long to apply — so don’t make them. Let your agency do its thing. Just make sure you do your best to collect all feedback from your content committee, validate it, ask us to act on it, and approve it. Back-and-forth processes need a way to capture iterations without forking into multitudes of copies in people’s inboxes. Tomorrow People uses Google Docs, because it lets us maintain a single copy of the document, offer access to multiple stakeholders, and collate comments from different people from a single source. So whatever you do, don’t start cutting and pasting into Word. Or worse, sending your agency ten different sets of comments! Agreeing on a single version of the truth saves huge volumes of time and hassle, and that means you save money, too. Don’t get personal and too attached. This is marketing material designed for a particular purpose. It’s not the latest issue of GQ Magazine. The rule of three: the first content you receive is a draft. It will not be perfect. The second review stage will be taking onboard your feedback and amends, and the third review will be when we aim to have it at the sign off stage. How long will it take me to review? Top tip: Remember your sign off dates: if you miss them, your timeline will move. While no literary giant would last ten seconds in a content marketing agency, we do ask you to understand one thing: our writers are professionals. Many have years of experience in journalism; many have shelves full of awards; some came to us from billion-dollar global ad agencies and are published authors. These guys are the best in the business. What that means is that if they chose a quirky word, or an unusual turn of phrase, it’s in your copy for a reason. To attract that extra slice of your reader’s attention; to put that abstract product benefit into concrete terms. We’re not writing for you — we’re writing for your customers. Past, present, and future. That’s how the editorial process works at Tomorrow People. We’ve got some of the world’s best writers on our team; some of them write hundreds of pieces a year for us, and they produce their best work when you follow the principles above. At the end of the day, it’s easy! To get the best content from your marketing agency, simply be available and relax. You’re in the hands of experts. And our expertise doesn’t just stop there. We don’t just write compelling content. We make it look the part too. Next up, we'll be taking a look at how our design team works their magic to help your content look its very best. Wanna know how the rest of the content marketing world fares when they create content? Well get a load of this: Content Marketing in the UK 2018: Benchmarks, budgets, and trends.